October is only a couple days away, and the internet is alive with “haunted” stories and Halloween decorating ideas. You know what, though? Halloween is not one of my favorite holidays, but I do have a scary story to share. Okay, not scary. 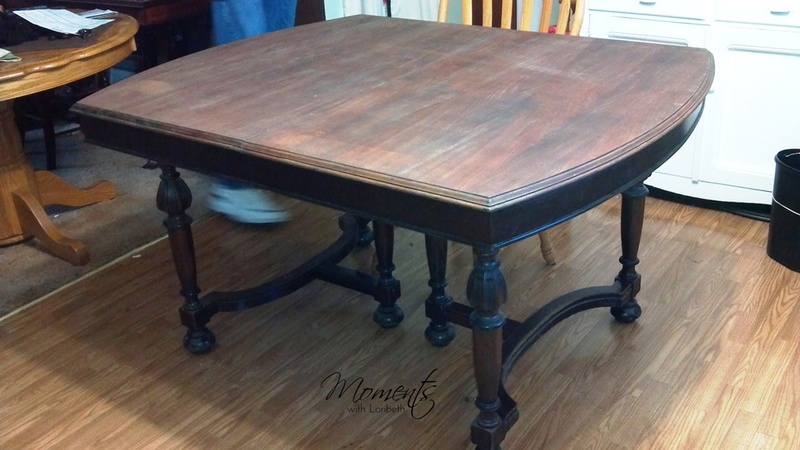 My “haunted” dining room table is not scary, and I’m not sure it’s actually haunted, but it is one of my best Craigslist finds. I found my “haunted” dining room table on Craigslist back in 2012. The people selling it couldn’t get a picture of it without orbs, so they thought it was haunted. It was in sad condition, but that’s because it was in someone’s barn, which might explain all the “orbs” all around it. I highly suspect those orbs were actually dust. After all, barns are not known for being dust-free places! I fell in love with it right away, so we snatched it up, brought it home, and cleaned it up. I had to refinish the top someone had stripped before we could use it, but I love refinishing furniture so that was almost like relaxation to me. I had big plans for that “haunted” table, I even considered painting the base. I kept that to myself when we were buying it, because the people we bought it from commented that they didn’t want anyone to paint it. Ultimately, I decided not to paint it–at least for now. Who knows what I’ll do to it in the future, but probably not. Ack! the chairs look awful! And those scary cushions! Can you believe those chair cushions??? What was I thinking? They were so ugly, they were scary, and they were uncomfortable. Maybe those cushions scared the spirits away that were haunting my table!!! Design tip, don’t use chair mass produced cushions. If you have to have cushions on your chairs, make your own or spend the money to have some custom made. 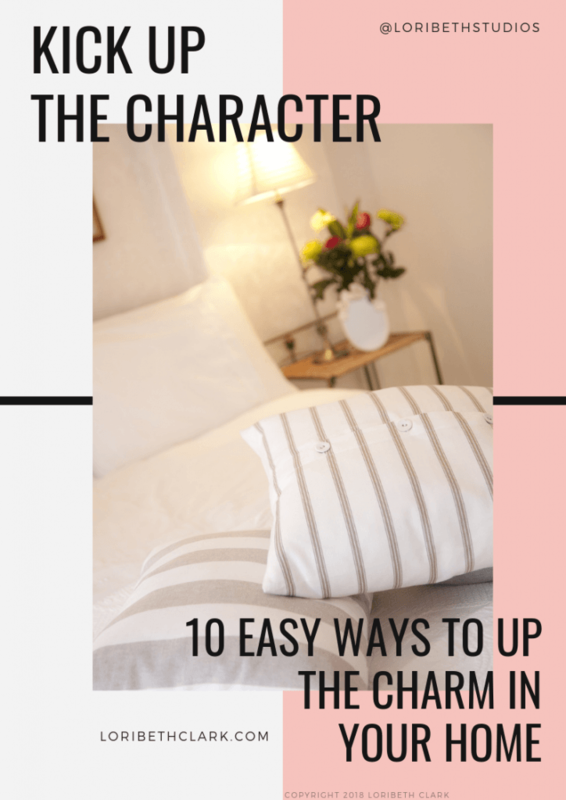 You won’t scare away your guests that way! I ended up painting those chairs because the two wood finishes clashed. 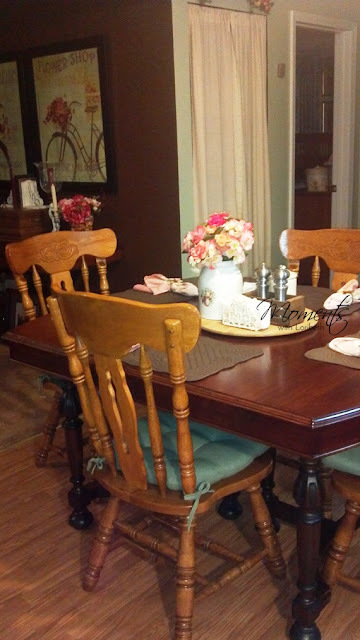 I was afraid the painted chairs would look too casual with the formal mahogany table, but I loved how they look together. The only reason I didn’t keep them is that they took up a lot of room in our tiny kitchen dining area. So when I found the smaller mahogany chairs, I listed the large white ones on Craigslist and someone snatched them up within a half hour. Now my “haunted” table is in the dining room of our new home. 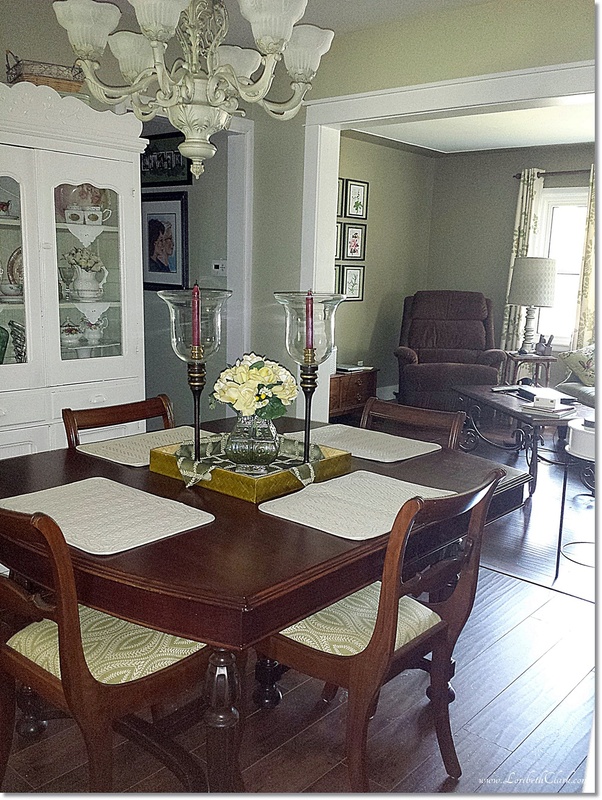 Our dining room is still on the small size, so the mahogany chairs fit perfectly in the space. I have five more of the chairs in the basement that I need to put new cushions on for when we have dinner parties. It’s nice that we can put leaves in the table and expand it for more family to sit around. This Thanksgiving, my “haunted” dining room table will be filled with family around it for the first time! I think that will most likely chase away any lingering ghosts! Unless they decide to stay for dinner!! It’s been a long time since I hosted a large family holiday dinner… Any tips are VERY welcome! I wonder where I could find one of those 3 compartment crockpot bases… I might have to do some online shopping today!! !